Barbara Arrowsmith Young has developed some solid methods for improving success among students with learning disabilities. Her program has been adopted at various schools in Canada and the US. The Arrowsmith program has been running for a decade in the Toronto Catholic DSB. Positive results for participants hold promise for many more. Laura Lessa’s day begins like that of many Special Education teachers around the province. Her students arrive, listen to the national anthem and a prayer, and then settle down to work. And that’s where the similarities end. Children strap patches over their left eyes and write symbol sequences over and over. They work on individualized computer exercises that track and report their progress. The exercises include things like math with flash cards, a concentration-memory game with symbols, and telling time on clock faces with up to 10 hands. The students are busy, focused and work individually, and they don’t see an ounce of curriculum. It’s a unique approach to delivering Special Education programming to say the least, and it’s getting high praise from teachers, parents and students. Lessa’s students at Transfiguration of Our Lord Catholic School in Toronto are part of the Arrowsmith program. All 11 children, ranging from Grades 1 through 8, have been identified with learning disabilities, so Lessa teaches in what is called a contained classroom. But it’s probably not like other withdrawal programs you’ve seen. Traditionally, children with learning disabilities are taught to compensate for them, not to overcome them. 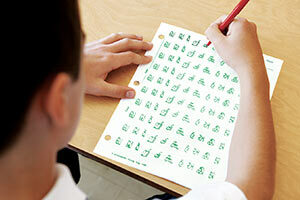 Those with poor fine-motor skills, for example, use computers to get around poor handwriting or are given classmates’ notes. Students who have difficulty doing mathematical calculations may use a calculator instead of struggling (and usually failing) to memorize their times tables. A child with ADD may learn organizational and time-management strategies. The Arrowsmith program takes a vastly different approach. Developed by Barbara Arrowsmith Young, it builds on the theory of neuroplasticity. Sheila Brown Vitullo has taught in the Toronto Catholic DSB for 25 years, the last nine as the Arrowsmith teacher at St. Theresa Shrine Catholic School in Scarborough. Before that, she taught as a regular classroom and Special Education teacher. The Arrowsmith approach holds that affected cognitive areas of the brain can be improved with strenuous mental exercises, leading to increased mental capacities and strengthened learning abilities. Furthermore, when a deficient area is improved, a child’s ability to perform complex tasks like reading and writing will also improve. It’s pretty radical thinking and it may well change the way we approach Special Education in this province. Young certainly hopes so. But it’s not for everyone. The Arrowsmith program helps students who are typically of average or above-average intelligence but are experiencing difficulties with a number of learning problems, including reading, writing, mathematics, remembering, understanding, dyslexia, non-verbal thinking and ADD-specific problems that include difficulty with talking and thinking simultaneously, retaining oral information or instructions, remembering symbol patterns necessary for reading, problem solving and mental arithmetic. It is not for students with behavioural problems, brain injuries or any of the autism-spectrum disorders. The program identifies and strengthens the weak cognitive capacities that affect learning. They are referred to as learning dysfunctions and Young’s research has identified 19 of them so far. She explains the program’s origins. Her teacher-mother devised a system to help her struggling daughter. Reading analog clocks, starting with two hands and moving up to 10, improves skills. Young says that today she would have been diagnosed as having dyslexia and auditory processing difficulties. She couldn’t understand, let alone remember, concepts or what she read in books. She couldn’t read clocks and she couldn’t keep up with class discussions. So she learned to compensate. Young was always unhappy in school and says it was a struggle. It’s probably how many children with learning disabilities feel today. Through sheer hard work, Young made it through high school and University of Guelph, where she pursued child studies. Young completed graduate work in school psychology at OISE and came to understand her own learning difficulties through reading the work of psychologist Mark Rosenzweig and neuropsychologist Alexander Luria, among others. Rosenzweig observed rats in three environments: an enriched one with toys, a normal one and a third one with no stimulation at all. He saw that the rats in the enriched environment were better able to learn new and complex tasks compared to the other two. He then studied their brains and found neurophysiological changes, including more neurotransmitters in the stimulated rats. He concluded that a rat’s brain is malleable and capable of improving its learning capacity as a result of stimulation. This was radical thinking in the early 1960s. Rosenzweig wondered whether his findings were applicable to humans and Young took up the challenge. “I created my clocks exercise to test Rosenzweig’s hypothesis on myself,” she explains. 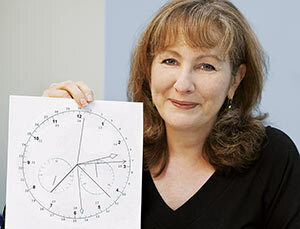 Barbara Arrowsmith Young found analogue clock drills that helped improve her own math abilities. 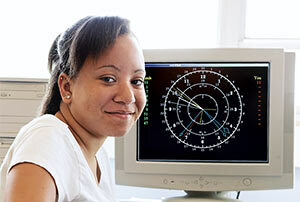 Young could not tell time with an analog clock and she always struggled to understand cause-and-effect relationships and mathematical concepts. She created hundreds of flash cards with clock faces and drilled herself to read time, first with two hands, then three and finally four. Young next turned to Luria’s work on the function of specific brain areas, which found that complex cognitive activities such as reading, writing and mathematics require the interaction of several brain areas. Luria concluded that if one area of the brain was impaired, the performance of the corresponding activity would also be impaired. Keeping Rosenzweig’s findings front and centre, Young developed brain-strengthening exercises. She tested her exercises on children with learning disabilities. First she identified their weak cognitive areas, then she removed their Special Education supports and finally she put her targeted exercises to work. She saw consistent improvement in the children’s academic abilities. Young went on to develop exercises to target each of the 19 learning dysfunctions she had identified. She developed the Arrowsmith program, opened the Arrowsmith school in Toronto in 1980, and started achieving tremendous and consistent success with students with learning disabilities. Today, as in 1980, each student is rigorously assessed and programs are tailored to meet individual needs. This includes written, visual, auditory and computer exercises. Under-functioning areas are treated like weak muscles and are intensely stimulated and strengthened through cognitive exercises. The goal is to capitalize on students’ increased learning capacities and reintegrate them into the full academic curriculum when they complete the program, typically after three to four years. Most students do not require further Special Education intervention or program modification. Students spend a minimum of four 40-minute periods per day on the Arrowsmith program, where the student-to-teacher ratio is 10 to one. improved verbal and non-verbal thinking, reasoning and problem solving. “It’s about repetitive brain exercise,” explains Laura Lessa as she watches her students at work. Children work at computers and practise reading analog clocks, just like Young did with flash cards in the 1970s. They start with just two hands and eventually move up to 10. This helps improve their understanding of the relationships necessary for mathematical reasoning, reading comprehension and determining cause and effect. Many students with learning disabilities struggle learning new words and find it difficult to think and talk at the same time. This exercise, called Broca’s after that area of the brain, helps overcome this dysfunction by developing a student’s capacity for sound-symbol correspondence and the phonemic memory necessary for phonetic reading. Students first listen to the words on a CD to hear and practise the syllables and emphasis. Then they do it on their own and when they’re ready they sit with their teacher to demonstrate their mastery of the set of words. There’s always another set waiting, with increased difficulty and more syllables. Students study Norman Rockwell pictures to figure out what is happening. They discuss the pictures with their teacher, who presses them to look at the clues, the details, to put together a story. Then they go away and think about the before – the events that led to the picture. Finally, they consider the after – what will happen next. This exercise is difficult for most students with learning disabilities because they struggle with problem solving and interpreting non-verbal information and facial expressions. But with practice, they learn to do it, and the carry-overs to their learning are enormous. In Lessa’s classroom at Transfiguration of Our Lord, Nathan is working with a patch on his left eye. He’s tracing symbols over and over, 30 minutes with the patch, five minutes without. When Nathan removes the patch and traces using both eyes, it’s much easier for him. He’s faster and his symbols are neater. This exercise is a vital one for all Arrowsmith students and they are also required to do it at home every night, as well as on weekends and holidays. 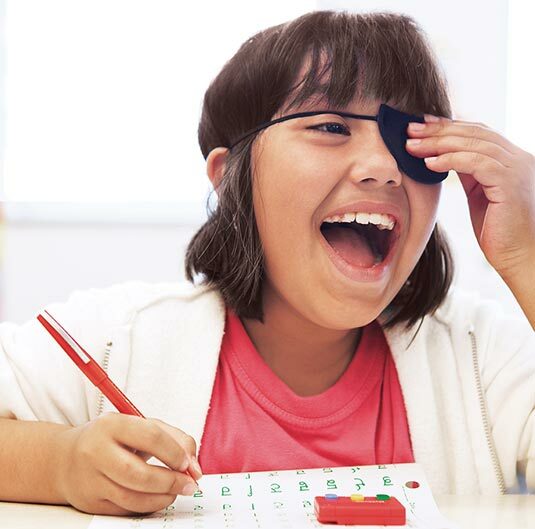 Tracing symbols over and over, 30 minutes with the eye patch, five minutes without, strengthens handwriting as well as the ability to focus and take notes. Nathan is confident that his handwriting and his ability to focus, take notes, concentrate and learn have vastly improved since he joined the program two years ago. There are a plethora of other exercises children perform, depending on their learning dysfunctions. All exercises increase in complexity and difficulty, and Lessa monitors progress and keeps the children moving forward. Performance-evaluation criteria built into each of the cognitive programs are based on the principles of accuracy, consistency and automaticity of task completion. Once students master a program level, they advance to a more difficult level. Individual programs are modified each year based on students’ progress. Because the focus of the program is cognitive development, Arrowsmith students get no traditional curriculum for at least half of their school day. So do they fall behind? It’s a common concern of parents with children in the program, but Sheila Brown Vitullo says it is never a problem. Most students are in her program from Grades 4 to 7 and, ideally, are reintegrated into regular classrooms in Grade 8. Most receive minimal Arrowsmith withdrawal support after completing the program. The focus is on getting back to the curriculum and getting ready for high school. “The graduates of our program have met with success in high school,” Brown Vitullo explains. “They have passed the Grade 10 literacy test and many have gone on to college or university. Young opened her first private Arrowsmith school in Toronto in 1980 and a branch of the Toronto school opened in Peterborough in 2005. Private schools in Ontario, British Columbia, California, Florida, New Jersey and New York also run the program. The Toronto Catholic DSB has operated seven sites for 10 years now. Tuition at the private Arrowsmith school in Toronto is $19,000 per year. There is no charge for programs run by the Toronto Catholic DSB. So why aren’t more schools running the program? Cost is certainly a factor. It costs $4,000 to start up a program, which includes training a teacher. Then there’s the yearly program fee of $3,500 per student. That’s a great deal of money, true, but surely a small amount in a school board’s overall budget. And it seems to be having a significant impact. Is it worth the investment? Does it work? One of the jobs of all Arrowsmith-trained teachers is to gather data on their students’ progress. Accordingly, the Toronto Catholic DSB wanted to know too and studied the students who had been through the program over its 10-year run. The resulting report examines student success on standardized achievement measures and the resource support needed pre- and post-program. It also compiles anecdotal input from parents, teachers and students on specific observable cognitive and academic gains and overall student success. The data shows that students’ rate of learning on specific academic tasks such as word recognition, arithmetic, reading comprehension and reading speed increased by one-and-a-half to three times the rate they were learning at prior to the program. “That’s significant improvement,” Young comments. Of the 42 Arrowsmith-program students in high school or postsecondary programs, 95 per cent had either no (69 per cent) or one period per day (26 per cent) of resource assistance. Prior to the program, 55 per cent of these students had one to two periods of resource assistance and 45 per cent had resource assistance for 50 to 100 per cent of their timetable. Their overall average on report cards in high school was 79 per cent. Those in postsecondary programs had marks between 80 and 90 per cent. Students interviewed for the report consistently commented on feeling more confident and doing better in school. In particular, their memories had improved. “I can focus, think and listen better,” was a common remark. Many students reported being better able to understand what the teacher was teaching and to take notes in class. Many reported improved handwriting and spelling and being able to read faster and more accurately. Many also reported improvements in math, including speed and accuracy. Parents, too, consistently commented on their children’s increased confidence, ability to focus and organizational skills. In all cases, students were achieving higher marks. I saw my son’s grades improving with Arrowsmith but was surprised to find the program improving the whole family’s quality of life as well. His auditory processing problems had impacted on everything from basic conversations to enjoying videos with the family. He would continuously make us rewind so he could follow the story at a slower pace. Needless to say, everyone waited until he was asleep to watch. Within four months he was watching along with the family and laughing at all the right parts … When he graduates … he will have a better quality of life, better relationships and more choices … People will finally know him as the bright child he always was. So is there anything a regular classroom teacher can take from the Arrowsmith program? Plenty, says Sheila Brown Vitullo. These children have not met with much success and many have low self-esteem. Arrowsmith motivates them. It’s interactive with the teacher, it’s focused, it provides instant feedback and, most importantly, it works. The children are able to do the work because it’s tailored to their needs and abilities. They learn very quickly that the exercises are going to help them do better and they can see their own progress. Barbara Arrowsmith Young would like all children to have wide-open futures. Her dream is to see every Grade 1 child receive two periods of Arrowsmith programming every day. Every teacher in an Arrowsmith classroom in the Toronto Catholic DSB has successfully completed the Arrowsmith training course. It’s an intensive three-week course, delivered in Toronto in August, designed to provide the theoretical background and practical skills necessary to supervise students in the Arrowsmith program. The course provides the methodology and materials needed to implement the program in a school, as well as ongoing supervision, support and professional development. It helps classroom teachers develop learning profiles for each student’s strengths and weaknesses in specific cognitive areas. It establishes a program of cognitive exercises based on the individual learning profile of each student for each year that student is enrolled. It provides monitoring and evaluation of the progress of each student through an online program record, which tracks students’ progress and measures their advancement against benchmarks. Andrea Peirson trains teachers in Arrowsmith techniques. A program co-ordinator is assigned to each school to monitor student progress monthly and provide ongoing support and professional development to the classroom teacher. Melissa Brown is the Arrowsmith program co-ordinator for the seven Toronto Catholic DSB schools where the program runs.